We offer wide variety of exclusive Designer Kurtis/Tunics to suit the personality of the individual.It is a perfect choice to be wear on formal as well as informal occasions.Our Kurtis fabricated using superior quality cotton fabric, it provides maximum comfort with a distinguished look. Party Wear Kurti Customers can avail from us a qualitative range , which is manufactured by our professionals in accordance with the industry laid standards & norms. These kurtis are embroidered by our experts using imported threads. Further, to meet the diverse requirements of the patrons, we are offering these stylish kurtis in various designs, colors and embroidery patterns. Ladies Tunic/Kurti Top. It is widely appreciated for the gorgeous patterns and suit every occasion.Some of the items include Ladies Designer Kurti,Ladies Designer Party Wear Kurti, Ladies Casual Kurti and Ladies Party Wear Kurti. Fancy Kurti Customers can avail from us a qualitative range of Ladies Stylish Pakistani Style Kurti, which is manufactured by our professionals in accordance with the industry laid standards & norms. These kurtis are embroidered by our experts using imported threads. Further, to meet the diverse requirements of the patrons, we are offering these stylish kurtis in various designs, colors and embroidery patterns. Ladies Tunic/Kurti Top. It is widely appreciated for the gorgeous patterns and suit every occasion.Some of the items include Ladies Designer Kurti,Ladies Designer Party Wear Kurti, Ladies Casual Kurti and Ladies Party Wear Kurti. Ladies Tunic/Kurti Top. It is widely appreciated for the gorgeous patterns and suit every occasion.Some of the items include Ladies Designer Kurti,Ladies Designer Party Wear Kurti, Ladies Casual Kurti and Ladies Party Wear Kurti. Tunics in various kind of beadwork, embroidered work etc., that makes our collection popular amongst people across the globe. These Tunics are unique in look. Our Ladies Tunics are available in unique designs and attractive shades. Anarkali Kurti Being a customer focused organization, we are engaged in offering a qualitative range to our respected clients. The offered range of designer kurtis are highly appreciated among the clients for their beautiful designs, skin-friendliness and color-fastness. The computerized design facilities and stitching help in the precise cutting and development of the cloth. Indo Western Designer Tunics. Under this range, we are offering Indo Western Kurti Tunic, Ladies Tunic Kurti, Ladies Designer Tunic and Ladies Indo Western Top Kurti. We are a trusted name of the industry engaged in offering a comprehensive range of excellent quality Indo Western Designer Tunics.We have a multiple range of Ladies Designer Kurti,Ladies Designer Party Wear Kurti, Ladies Casual Kurti and Ladies Party Wear Kurti.This western style tunic / kurti also have such design but with little modifications. Casual regular sleeveless tunic. Designer Casual Kurta. We have manufactured these casual kurtas using top-notch quality fabrics and imported threads. Owing to their comfortability and skin-friendliness, these designer casual kurtas can be worn at long day events. Stylish Kurti Looks very stylish with jeans, tights or leggings. Kurtis Tops fashion considered as evergreen style so it never goes out from fashion since centuries. Young girls to old age women's both prefer wearing in casual, and semi formal events. Modern technologies has modified the style and designs of Tops western dress , so now skinny, loose, baggy, funky and frocks tops, western style. Ladies Fashion Kurti. Offered ladies fashion kurta is designed & developed by our experienced and highly skilled fashion designers. To manufacture these kurtas our professionals make use of excellent quality fabric and imported threads. 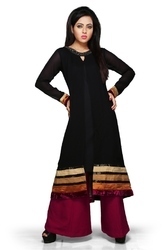 Beautiful Designer party wear kurti tunic in western style Ladies Fashion Long Kurta. Offered ladies fashion kurta is designed & developed by our experienced and highly skilled fashion designers. To manufacture these kurtas our professionals make use of excellent quality fabric and imported threads. These kurtas posses many quality attributes like smooth texture, Designer Casual Kurta. We have manufactured these casual kurtas using top-notch quality fabrics and imported threads. Owing to their comfortability and skin-friendliness, these designer casual kurtas can be worn at long day events. We are a trusted name of the industry engaged in offering a comprehensive range of excellent quality Indo Western Designer Tunics. Under this range, we are offering Indo Western Kurti Tunic, Ladies Tunic Kurti, Ladies Designer Tunic and Ladies Indo Western Top Kurti. Our team of expert designers have manufactured these designer tunic using best quality fabrics, threads and allied material. Due to their latest designs, attractive patterns and beautiful colors, these tunics can be worn at both casual and party occasions. Looks very stylish with jeans, tights or leggings. Kurtis Tops fashion considered as evergreen style so it never goes out from fashion since centuries. Young girls to old age women's both prefer wearing Kurtis Tops Western dresses in casual, and semi formal events. Modern technologies has modified the style and designs of Tops western dress , so now skinny, loose, baggy, funky and frocks tops, western style.